Why do 350 of America's finest truck drivers choose to drive at Solar Transport? Maybe it's because of our extensive history and continued growth provide the ultimate job security and peace of mind. Or maybe it's because we genuinely value our team members and go above and beyond to recognize and reward their hard work. From being home every day to a 401(k) plan, local trucking jobs at Solar Transport come with many benefits. Indeed, at Solar Transport you will be given every opportunity to realize your potential and enjoy a fulfilling fuel transportation career as a valued part of America's finest fleet. In fact, you will discover that our local drivers are more than just a part of our long-standing success - they're essential to it. Unlike other fuel transportation companies, Solar Transport jobs are more than just a career, they're a lifestyle. Solar Transport's regional network of more than 40 locations in 19 states keeps our truck drivers close to home, and flexible and predictable schedules ensures they are home every day. Solar Transport is a family-focused fuel-transportation company, and we respect and appreciate your right to a balanced and rewarding life outside of work. As much as our driver associates enjoy their jobs, they certainly don't do it for free. At Solar Transport, we know recruiting and retaining the best drivers requires competitive compensation. Thus, we are consistently evaluating and improving benefits packages in order to stay ahead of the competition. At Solar Transport, your safety is paramount. 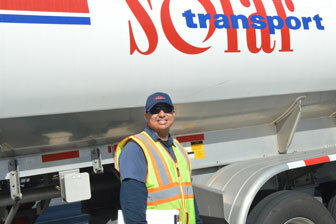 When you hold a fuel transportation career with us, our number one goal each day is to perform the job in a safe, efficient and timely manner - and with ZERO incidents. Interested in joining America's finest fleet? Please review the criteria below and apply online for a local trucking job today! If the above qualifications are met, a job with Solar Transport could be the move that propels your fuel transportation career to the next level. So the real question is, what are you waiting for? Applicants have rights under Federal Employment Laws, click on the links below for additional information.